Looking for the perfect way to send some love? Here is just one idea of how to put together a care package for someone in your life. 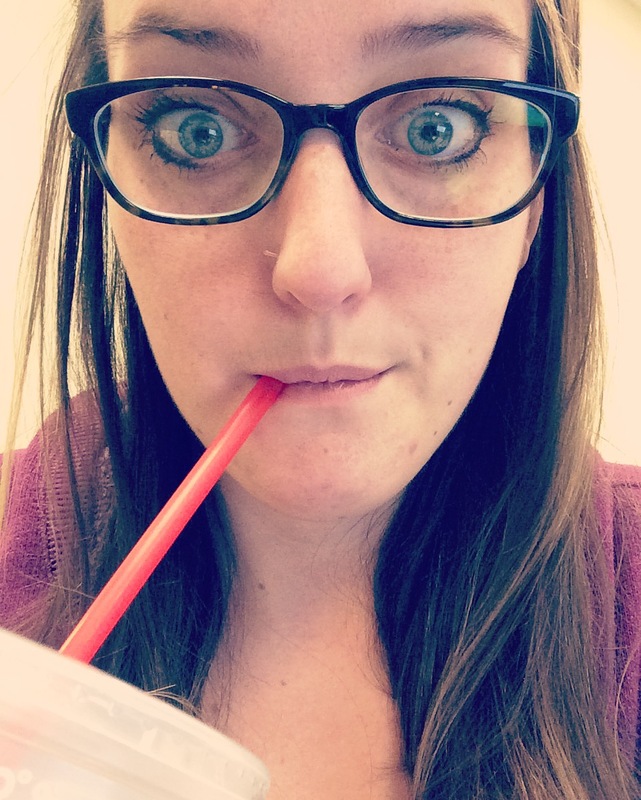 This week’s post is inspired by the brother-in-law that I have yet to meet. As some of you readers may remember from Recently Empty Nested’s post , Forrest has been away on his mission for quite some time and if you’ve kept track like the rest of us he is just two short months away from returning home! 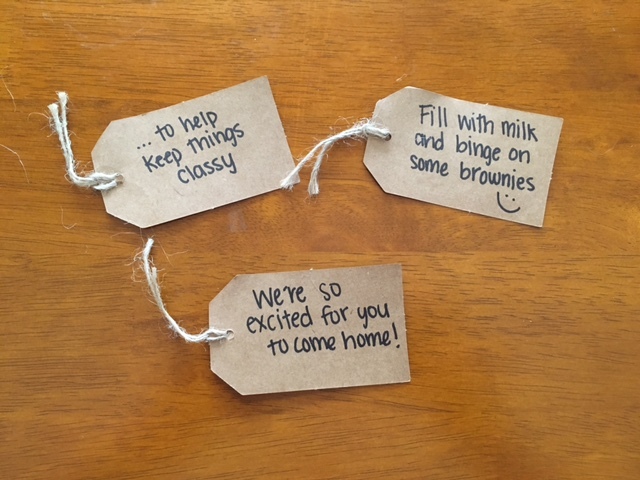 A care package seemed appropriately timed as we countdown the days to his homecoming. 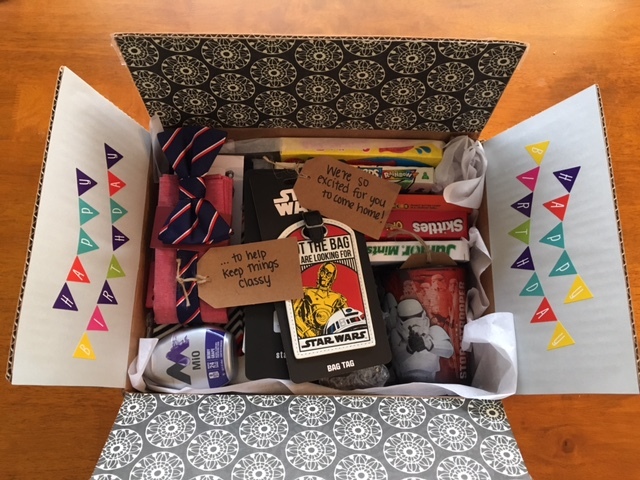 This week is his Birthday and while it’s hard to not get to celebrate this joyous occasion with him, a care package seemed like the perfect way to remind him of how loved he is and how much we’re thinking of him. Unfortunately I’ve not had the pleasure of getting to meet Forrest yet but from all of the stories told by his siblings and the smiles on my in-laws faces whenever he is mentioned it is clear that it will truly be a pleasure to meet him. This did make putting together a care package slightly tricky so I must admit that I enlisted the help of my husband in picking out items to go in this care package, but the point is to choose things that are fun and will bring joy to the person on the receiving end. So first things first, having the appropriate size box. Make sure all of your items will fit before starting to decorate your box!! I like things to be a bit snug so that when the box gets opened I know exactly how it will look because nothing can shift around. 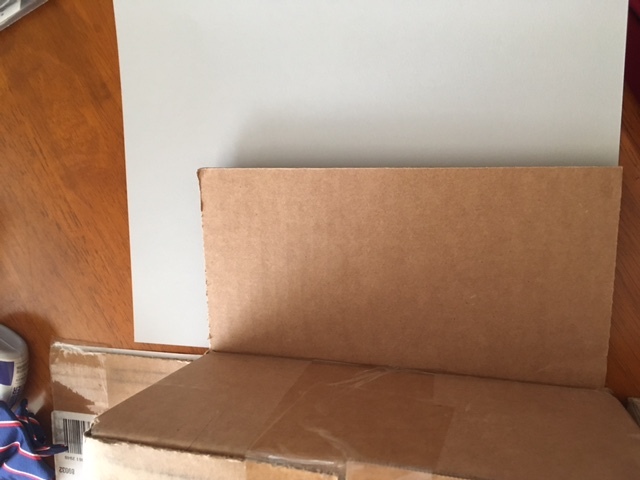 I then take colored paper or scrapbook paper and cut out the appropriate size to cover the flaps of the box. You can adhere the paper to the cardboard with mod podge, glue sticks, hot glue or double sided tape. This is the perfect opportunity to use those boxes that may be stacking up from someone’s late night online shopping, please tell me I’m not alone in this one!? I also found some fun banner style stickers to add to the sides, if you don’t have any stickers, markers or even stamp letters are a perfect alternative. I chose to only cover the flaps of the box, I’ve tried before to cover the bottom and inside walls of the box with paper but I’ve found that using tissue paper is much easier and a huge time saver! When filling your care package with items the selection should be based on your personality, the recipient’s personality and the relationship you have with them. Care packages that I would send to my sister while she was away at school would include tattoo sleeves and crazy hair accessories, whereas care packages sent to my late grandfather would include the sugar cookies he grew up eating. But I do have one rule that I try to always follow, there should always be something homemade. Nothing is better than opening a care package that has your mom’s famous chocolate chip cookies, or Grandma’s county fair ribbon winning apple pie, in this case I went with some super chocolatey brownies (individually wrapped). 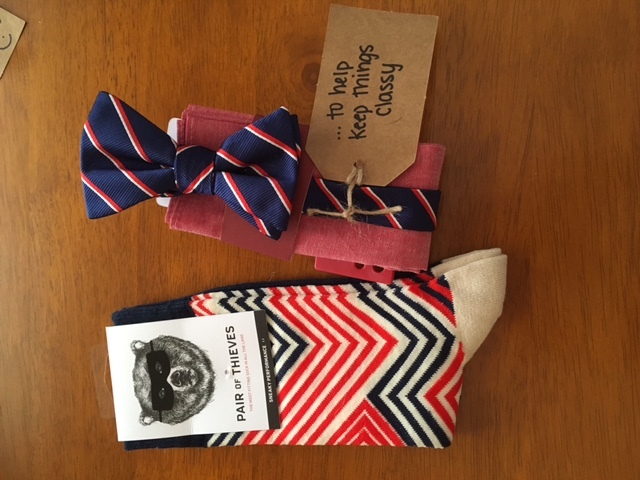 Bowtie, Pocket Square and some fun socks – according to all of the stories I’ve heard, this will be right up his alley and much appreciated. Candy/Fruit Snacks – A must have for a care package, also tends to ship really well. *Grubwife Tip – stay away from chocolate candies that are not in boxes, they tend to melt and can even escape there wrapping and get on to other items. 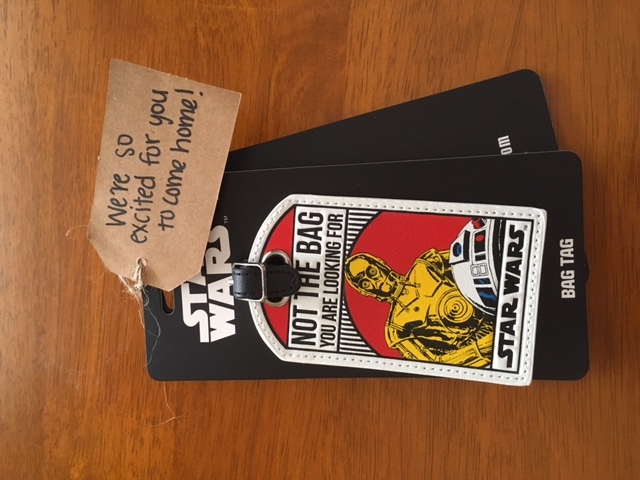 Luggage Tags – What can I say? We’re kind of excited for him to come home and wanted to help make sure his baggage made it home too. Star Wars Masks – remember when I said I enlisted my husband’s help? Enough said. I hope this gave you some fun ideas for the next care package you send or even inspired you to find a reason to send someone a care package. 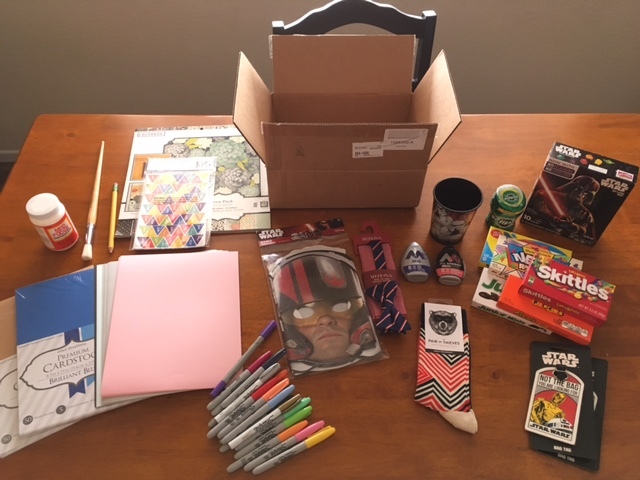 Share with us some of your favorite items to put in to a care package!